Two posts on Turkish magazines in the span of a couple of days, I'm on a role here. This post is much different than Paris Hilton's Vogue cover. This is something that hits closer to home, it's something that I was avoiding because I didn't really want to get political on my blog, but constantly seeing it on other blogs and websites... I couldn't just sit quietly anymore. 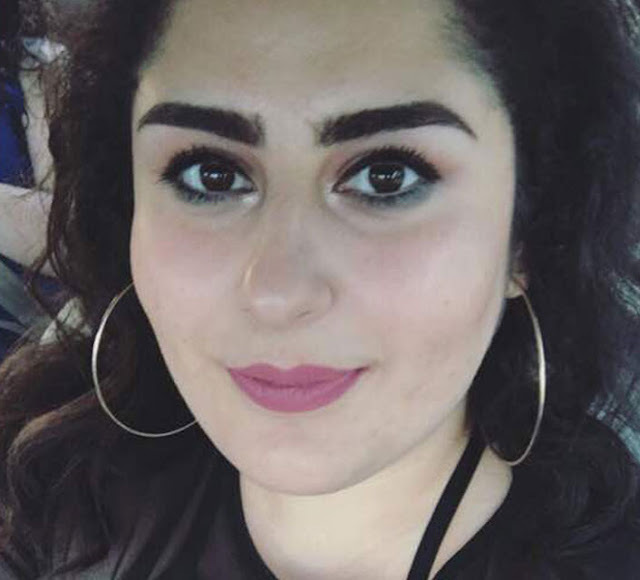 On January 6th I was checking out one of my favorite blogs, A Haute Mess, where I saw a post titled "elle turkey gives us a lesson in maxi skirts", I thought it would be a "how to wear maxi skirts" post or something like that. I clicked on the link and was shocked to see an editorial set in the ruins of Armenian churches. As some of you might know by now...I'm of Armenian origin, and this was a bit of a slap on the face for me. I tweeted at Nikki from a haute mess, she had no idea about the history of the setting she was merely admiring the beauty of the editorial. In order to understand the controversy, you need to know a bit about the history of the setting and the shoot; I've inserted an exert from the article from ianyanmag.com that explains everything quiet clearly. 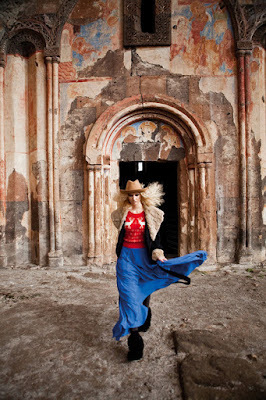 Elle Turkey’s December editorial spread in which models Ana Zalewska and Karolin Machova prance through and pose in the now ruined and abandoned Armenian city of Ani has been met with criticism from Armenians angry at the use of the 5th century medieval capital whose population was slaughtered by Seljuk Turks and now has been identified as one of the 12 worldwide sites most “On the Verge” of irreparable loss and destruction according to the Global Heritage Fund. The spread, photographed by Senol Altun and styled by Melis Agazat shows the models in striking knits and patterns in and around the “City of 1001 Churches” but the sacrifice of an ancient site in the name of fashion has left many up in arms. The photos, posted on Fashion Gone Rogue has received an influx of comments condemning the shoot. Anyway back to the story, so I clicked on the link and I saw that it wasn't actually a "How to" post but an editorial. I scrolled down and was horrified to see the ruins of the Armenian churches of the historic city of Ani staring at me behind the models. This city was the city of 1001 churches, it was the home of historical Armenian Kingdoms (Pakraduni) and is located in "historical Armenia" a.k.a. current/modern Turkey. 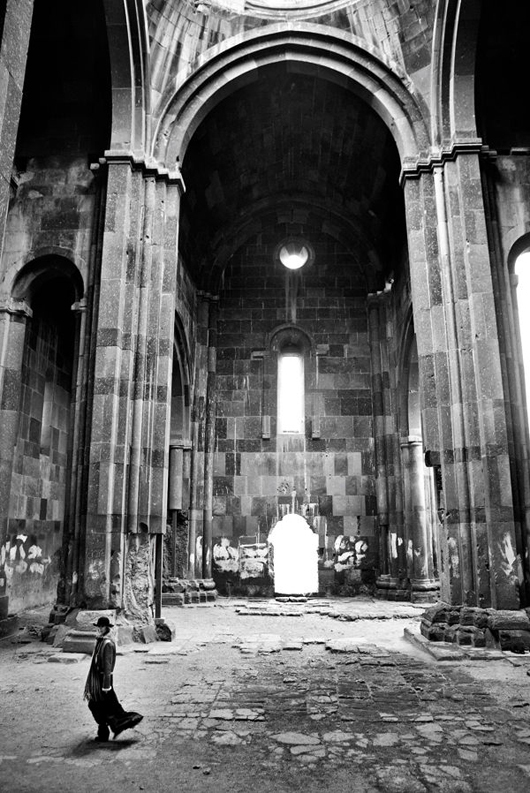 The churches are a BIG part of our history, Armenia was the FIRST nation in the world to declare Christianity as its official religion back in 301 A.D. To see these churches abandoned and in ruins is painful enough; but to see it being being remembered as merely a backdrop for an editorial to sell a magazine was a slap on the face. I think the world would be in outrage! My reaction is appropriate, especially when I'm being as "nice" as I can be regarding this issue. 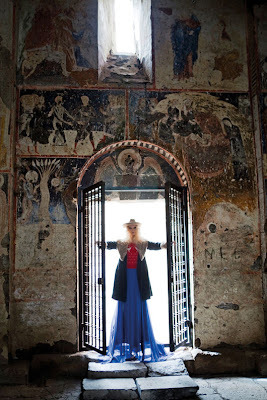 Shooting an editorial in a church is controversial already, shooting it in the ruins of the churches that were left to wither away along with the issue of the genocide? Super offensively controversial, a mouthful I know but I couldn't find another way to describe it. I'm sure the intention of the Elle Turkey magazine was to shoot a beautiful editorial and not to offend the Armenians, but knowing that this is a sensitive area...they should have been a bit more considerate. Elle is one of my favorite fashion magazines, and I highly respect the publication but I'm VERY disappointed with this. Although the editorial was in the Turkish issue of the magazine and not the main english ones, it's still under the "ELLE" name and everything is international once it's posted online. Elle Turkey, if you're reading this, please take it into consideration next time you shoot an editorial. To read more about the issue of the Armenians and the Armenian Genocide, here are some useful links. It is so important to be aware of issues like this, thank you for enlightening me. Hopefully something positive will come about from this, more attention to an issue that is really in need of a spotlight. Aline , very very good post . 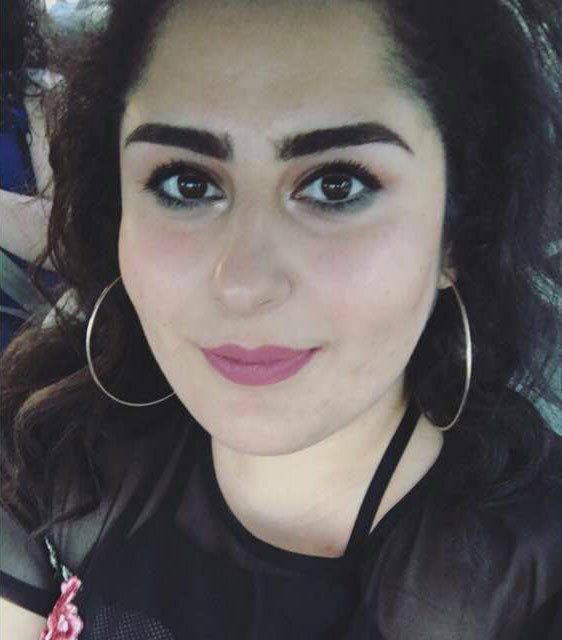 It is time for Armenian activists to get our of the so-called genocide limbo. Instead of criticizing Elle (Turkey) for spreading the Armenian culture among its readers, Armenians should financially contribute tot he restoration of Ani as recently envisaged by the Turkish government.